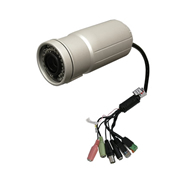 The BCL-IP2200MP is an advanced IP security camera designed for outdoor use. It contains a reduced-instruction set CPU (RISC) that gives it the strength to function on its own and communicate with compatible cell phones and networks. It provides high definition streaming video output in a variety of compression formats and has microphone and speaker connectors for 2-way communication. Image pickup starts with a 3.6-16mm manual varifocal lens (megapixel rated). A 1/3-inch CMOS 2M video sensor generates high definition, 720P images at up to 30 frames per second, which can be adjusted through on-board controls (brightness, color, etc.). You can order it with or without a video output connector (composite video), which aids setup and installation as well as troubleshooting tasks. 16G of on-board memory gives this camera the capability for advanced functions. Video cable available for attaching a test monitor during installation.